Home sales in Evanston picked up in April even as national homeownership rate hit a 17-year low, according to a new report from the U.S. Census Bureau. The report, released April 30, shows the national homeownership rate declined to 65.2 percent in the first quarter of 2013, pushing more people to consider renting. In Evanston, however, about twice as many residential homes were sold in April compared with a year ago, as falling housing inventory and record-low mortgage rates propelled real estate market activity, according to a report by the real estate company @properties. Evanston homes for sale sit on the market for an average of 83 days compared with 151 days in April 2012, indicating the demand for residential homes has increased, according to the report. “The trend is that the market is stabilizing, and investors and developers are still very cautious and are looking to return that investment,” said Alan Goldberg, a broker with Fara Commercial Brokerage. Homeownership rates remained steady in Evanston and the Midwest region partly because homebuyers had been more cautious during the housing market downturn, said Martin Walsh, chairman of the board of the North Shore-Barrington Association of REALTORS. At the same time, though, more people were looking to rent properties rather than buy homes, Walsh said. Some Northwestern students have seen recent increases in their monthly rent. Medill senior David DeChant said monthly rent for his house near the intersection of Foster Street and Sherman Avenue has increased by $17. Although his monthly rent is “significantly above” the typical $600-650 range, DeChant said he considered his home, located a few blocks from the north end of campus, to be prime property. “I wouldn’t say price is a huge consideration for the people I am living with,” DeChant, who has lived off campus for three years, said. Landlords are not the only people taking advantage of an uptick in prospective renters. Three large developers are planning new rental apartment projects in Evanston, including a two-building luxury apartment complex in downtown Evanston that will be developed by Fifield Companies and Carroll Properties. The firms expect to lease out some of the complex’s 368-unit luxury apartments to NU graduate students, Fifield’s vice president Alan Schachtman said. Schachtman estimated the apartment units would sell in the high $2-per-square-foot range. In addition to NU graduate students, the developers expect to attract empty-nesters after construction is completed in about two years, he said. Robert Horne, president of Dodge Capital, LLC, said his firm decided to develop an apartment project on Central Street as the apartment market began to recover. The project is scheduled to finish in August, Horne said. One of the reasons people may be considering renting over buying a home is higher borrowing qualifications from banks in the last five years, Horne said. Coldwell Banker broker Paul Cionczyk said more people are looking to rent because they do not meet the qualifications to buy homes. 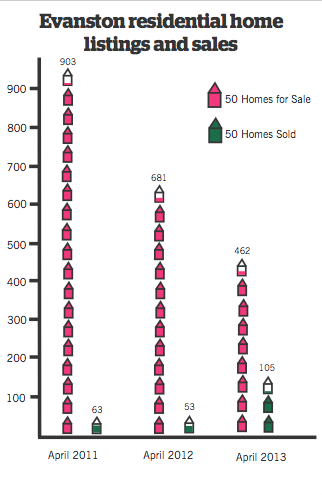 Nevertheless, Evanston residential homes are selling rapidly. In April, 105 properties were sold compared with 53 properties last year, according to the @properties report. Many homebuyers have sold their homes in Chicago to move farther north, where more homes are available for sale, said Walsh, who works for the North Shore-Barrington Association of REALTORS.